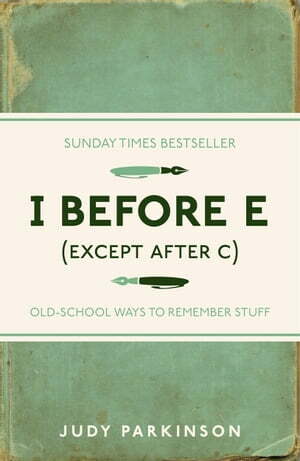 Collins Booksellers - I Before E (Except After C) by Judy Parkinson, 9781843174318. Buy this book online. Ever find yourself struggling to remember simple facts and rules? Is the ever increasing pace of life and glut of information challenging your memory? I Before E (Except After C) is full of memory aids to help you out. From well known rhymes such as the popular 'Thirty days hath September, April, June and November', memorable sayings including 'Spring forward, fall back', and mnemonics such as 'Richard of York Gave Battle in Vain', to a selection of more modern methods of boosting one's failing memory. I Before E is the definitive guide to help you to unjumble your mind and improve your ability to recall names, dates, facts, figures and events, and contains all the mnemonics you'll ever need to know.